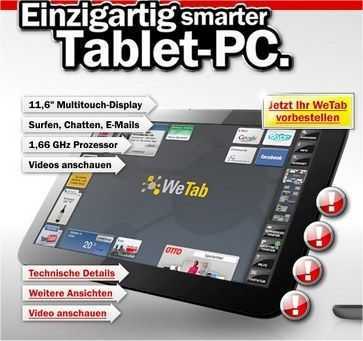 Although the WeTab (formerly WePad) has been available for pre-order on Amazon for some time, there’s been some doubt about whether it really is going to launch but with the recent discovery of an advert on one of the biggest German electronic stores website, it looks like the WeTab really is on track. 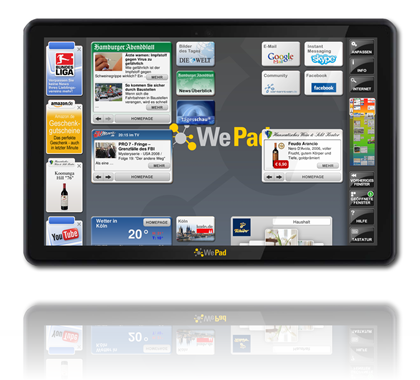 The WeTab is built on an Intel platform with a standard Linux core and a self-built user interface. 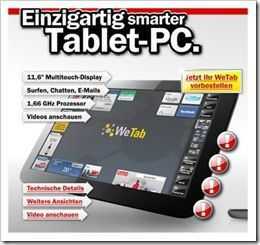 I’m interested to see if WeTab have used any MeeGo components. I’m also interested to see the battery life. The WePad is based on a Pinetrail platform which can idle down to about 4-5W but jumps to 7-12W when in use. If the device is 800gm then we’re only talking about a 25-30Wh battery which means 3-4hours in use. Compare that to the iPad at the same weight and you’ve got a serious disadvantage. The WeTab is an interesting project that has gained an amazing amount of traction but unless the UI is something really really special, I personally think that it’s going to disappoint. We look forward to mid Sept where I’m sure we’ll see it at Intel’s IDF. 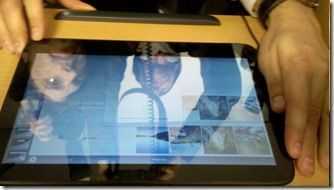 WePad Live Demos Analysed. Ubuntu Spotted. The most important take-away is that this is not an Android-based Linux build as first thought. It’s a heavily modified Ubuntu distro with overlay software. The Android aspect is likely to coming from Canonicals Dalvik runtime which will provide some Android application support but don’t expect the Google Marketplace or Google Apps such as Maps, Mail or Sky to be running on this. Below you can find the notes I made as I went through the video. Some of the notes are my own thoughts and conclusions and not information taken direct from the video. 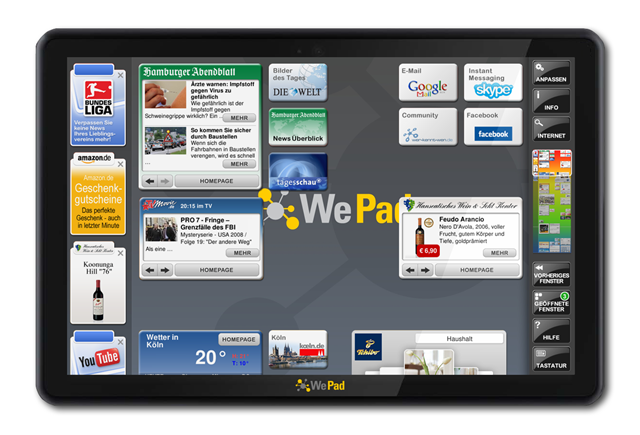 More information on the WePad is available in our WePad information page. 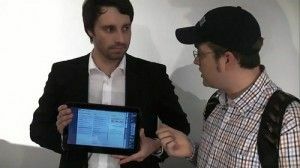 As promised in our extended coverage of the WePad launch event, here are the first hands-on videos from our podcast partner over at NetbookNews, Sascha Pallenberg who was at the WePad launch event today. Sascha seems quite unimpressed with the event saying that there was only one device available and that was only running a demo slideshow. The WePad wasn’t really available to test! First demo versions are planned to do the rounds in May and lets hope they live up to the hype. Riding around the iPad wave is a dangerous sport! Be sure to listen to the next MeetMobility podcast where we’ll talk a little more about the WePad. Unless, of course, it’s faded into dark history by then! 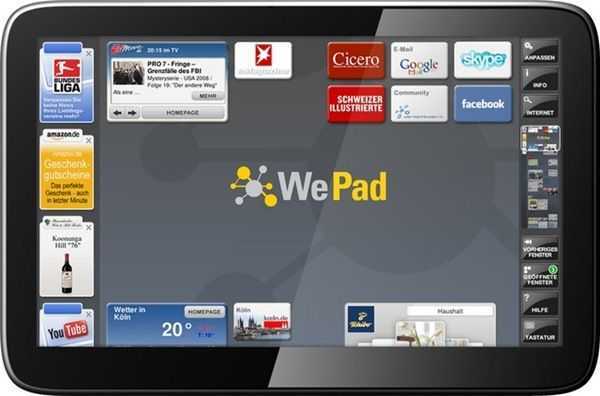 It seems like ‘Pad’ Fever has hit Berlin today as WePad ride on the wave with their WePad product. Sascha from (Netbooknews, Meet:Mobility) was there and we’ve been tracking news coming out of the press conference. Note: Our tracking page for the WePad is here. Updating as the conference happensâ€¦..
Adobe partnership. Flash and AIR will be available. Joint venture between 4titoo und Neofonie. Siemens, Intel and Adobe partners. Chippy: ExpoPC will use the same hardware. Pegtron we believe. Chippy: We’re waiting for price, battery life, availabilityâ€¦â€¦. Stern Magazine (an important German magazine) will be available on the WePad. Chippy: Looks like a DE-Only focus right now. Pricing: ‘Only’ 300 Euro. Chippy: Details of that unknown at present. Is it subsidised? Update: Wrong info from random tweet! See official pricing below. Chippy: No mention of Google Marketplace yet. 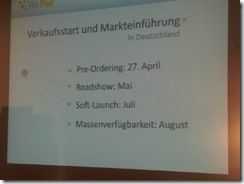 Wepad preorder 27.4., soft launch in July, mass availability in August. Via Tabletprofi twitter. 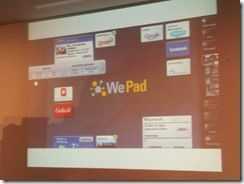 WePad Roadshow will be in May. Chippy: Outstanding: International availability, Marketplace, battery life, carrier deals? Chippy: Initial thoughts on pricing: 569 Euro is good for a 3G-enabled device at 800gm. Battery life still could be a showstopper. I’ll be interested to see how ExoPC respond. Chippy: Word coming in that it runs full Linux build but can run Android apps. Sounds like a Dalvik runtime is included. Dalvik Turbo perhaps? Chippy: Still no word about battery capacity. Usually an indicator that it’s not good! Chippy: Still waiting for news about Google Marketplace. IMO it’s not happening. 3rd party app store? AppUp? If this is an intel partnership. Is it Moblin/MeeGo? If so, it could have AppUp store. AppStore is called the ‘WePad Meta-Store’ Includes native, Java, Adobe, Android apps. Chippy: Based on latest info, I’m guessing the OS is based on Canonical Ubuntu with their Dalvik Runtime engine. 2nd choice: Moblin core. Not sure where the app store is coming from. WePad are planning telecoms and media partnerships. First Video from press conference. Chippy Opinion: If you ask me, they chose the wrong platform to deliver what is effectively an ereader. They are playing a dangerous game by riding on the iPad wave too. 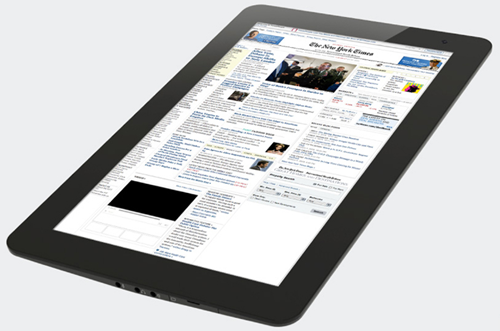 800gm is, like on the iPad at 680gm, heavy. Too heavy. Battery life will be 4 hours online in my estimate. International availability is unknown. There are question marks about Android on the X86 Linux build and if there’s no ‘point of sale’ marketplace, what incentive does any developer have to write apps for it? I can’t imagine this having a true Google Marketplace. Not without voice, haptics, 3G anyway. Note: Google were not mentioned as a partner. Final word for today: Competing devices from experienced Android/Smartphone manufacturers will stream-roll this within 12 months. That wraps it up for now. I’ve been on the phone with Sascha who was at the conference. Stay tuned to Netbooknews.com (and .de) for his video. 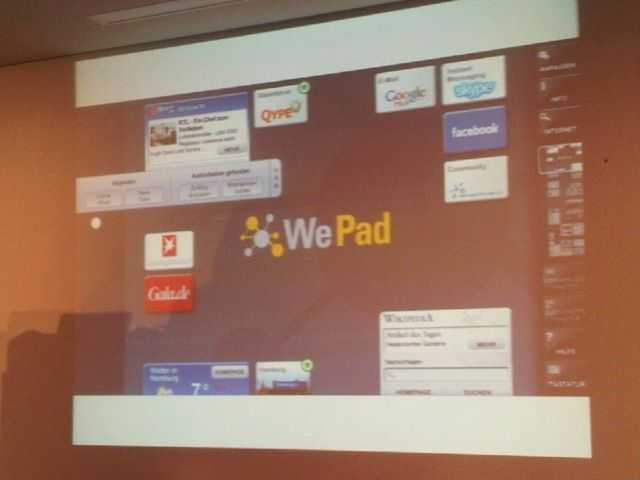 WePad Press Conference Starts in a Few Hours – Sascha Is There. Update: All press conference info in a blog post here. Chance of a ‘Wow’ this afternoon: About 30% if you ask me! 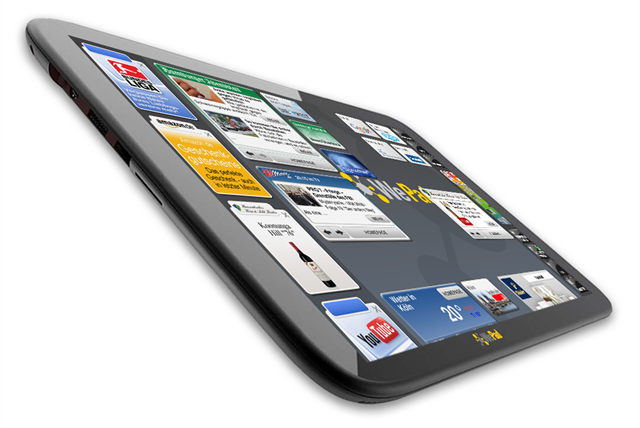 Neofonie’s WePad Intel/Android Tablet Looks Like a Real Challenge. This is the first time we’ve seen a product built with an Intel Atom processor using Android including, the Google Marketplace application, Flash and Air. Add an 11.6″ multitouch screen and a target weight of 800gm with 6 hours battery life and you’ve got a very challenging project indeed. Neofonie hopes to make it happen with the WePad. There’s no technical reason that Android can’t run on an Intel platform and in fact there are X86 builds out there for you to test but its when you add ‘Flash’ ‘Air’ and ‘Google Marketplace’ that you get a feeling for the timescales and risks involved in this project. Even the battery life is a little on the overzealous side. We’ve never seen an 800gm device running on any sort of X86 platform return 6 hours battery life with a 11.6 inch screen. 4hrs is a far more realistic figure in our opinion. The strategic partner in this operation might be Siemens and the idea might be good (we’re particularly interested to see if Google allow their marketplace on such a device) but the hardware build looks very expensive, the project feels like its going to take a long time and it looks like there are risks involved on the way. We’re not getting too excited just yet but we’re going to try hard to put our German ‘Pad’ company in contact with their German ‘Pad’ company to see if we can get a visit/hands-on/interview set up. Stay tuned. Update: More WePad information is going to be announced. Partners will be announced this week and pricing and availability on the 12th April. See Facebook fan page. Our pricing guess: 800 Euro with 3G, without content/3G deal/subsidy. English information (PDF) is available. Other: Ambient Light Sensor, Accelerometer, Stereo Speakers, internal microphone. This is the first time we’ve seen a product built with an Intel Atom processor using the open source operating system Android including the Google Marketplace application, Flash and Air. Add an 11.6″ multitouch screen and a target weight of 800gm and 6 hours battery life and you’ve got a very challenging project indeed. Neofonie hopes to make it happen with the WePad.